Sitting on a mat underneath a tarp that blows forcefully in the wind, 11-year-old Sakeena Mteir holds two pieces of paper that are among her only possessions. One is a colorful drawing of flowers. The other is a drawing of a tree. “I love to draw,” Sakeena says as she hugs her artwork to her chest, a shy smile unfolding across her face. The artwork is the product of a summer camp run by the Congregation of our Lady of Charity of the Good Shepherd Sisters and supported by Catholic Relief Services (CRS) with funding from Caritas Australia. With a presence in Lebanon’s remote Bekaa Valley since 2006, the Sisters have been supporting the local community since that time, and working with Syrian refugee children and their families with educational activities and emergency relief since the conflict in Syria started in 2011. With her thick black hair pulled into a long ponytail, a bright pink t-shirt, and multi-colored nail polish, Sakeena looks like your typical 11-year-old. And in some ways, she is. But for more than four years, Sakeena has lived in the Bekaa Valley with her parents and eight siblings in a makeshift shelter made of a few wood beams and an assortment of tarps. Sakeena’s father, Isameil, used to work on a farm in the Bekaa Valley before the war started. He then moved the family from Syria to live with him. But with the war showing no end in sight, the family continues to live there in limbo. “If God let the war end tomorrow, we would walk barefoot back home,” Sakeena’s mother, Turfa Jassem, laments. The Bekaa Valley, which borders Syria, is home to much of the country’s farmland. It’s also where an estimated 142,000 Syrian refugees are living in harsh conditions in informal tent settlements. More than half of Syrian refugees are children, most of whom have been out of school for more than two years. 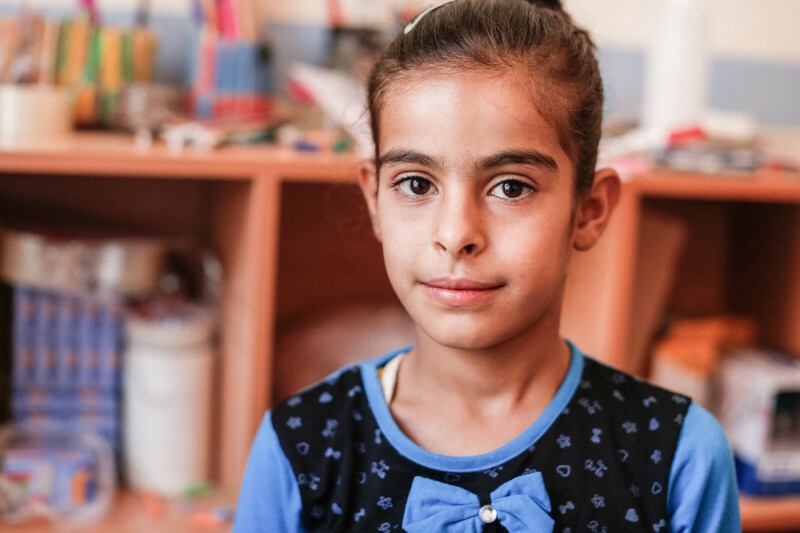 To fill that void, the Sisters, in partnership with CRS, provide hundreds of Syrian children with a wide range of year-round educational support so that they can learn, play, and heal in a safe environment. 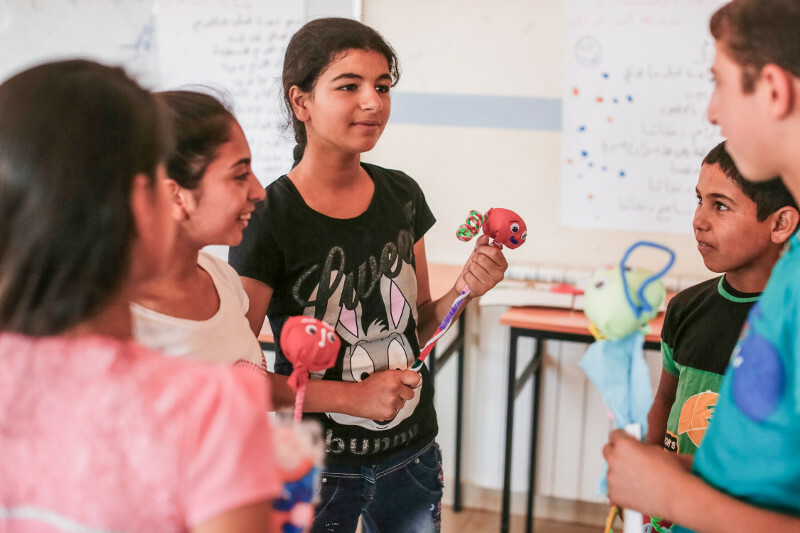 Activities run out of their center in Deir el Ahmar include non-formal education, field trips, recreational games, and the summer camp, which helps children deal with trauma, and which Sakeena recently attended. “Children need to get out of the refugee settlements more because it’s not healthy for them. There is violence there, and they don’t get proper education,” explains Sister Micheline, who has served as director of the Good Shepherd Sisters Center since 2006. 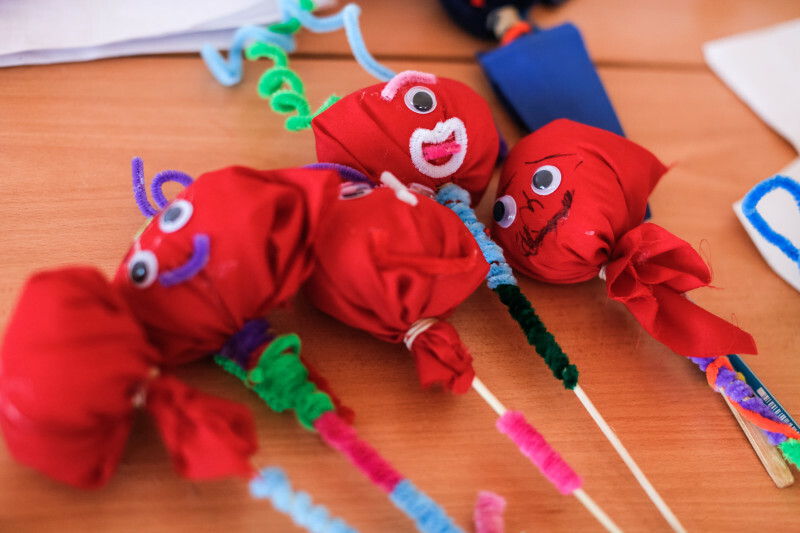 A critical component of the summer camp is a CRS project that uses No Strings International puppetry to help children – many traumatized by war — deal with their emotions. The CRS-commissioned films, Red Top, Blue Top and Out of the Shadows, are produced to reflect the children’s cultural context and star puppet characters that deliver messages about peace building and dealing with trauma. During the camp, the films are paired with activities like puppet-making and drawing. Trained animators work with the children and use their reflections on the films to gain their trust and to draw them out of their shells. By discussing the characters’ emotions and actions – similar to their own – the children are often taking the first steps toward addressing their own trauma. Sakeena’s puppet is made of a gray piece of cloth that’s tied to a stick. She says she plays with her puppet at home and at school. For Sakeena’s mom, the support her children get through the Good Shepherd Sisters lifts up everyone in the household. As for the future of Sakeena’s family, and all of the other family’s in the Bekaa Valley, Sister Micheline’s hope is that someday, they find peace. “I hope and wish that the children will be able to go back to their country filled with the will to commit to building a better life for themselves and their country,” she says.